Can we agree January is the month to be cozy cute and not wear real outfits?! Seriously, I live in athleisure this month and it’s only appropriate that’s basically all I’ve ordered recently! I thought it would be fun to share a few of the recent athleisure purchases I’m loving (bonus: they’re almost all under $50 even sneakers!). 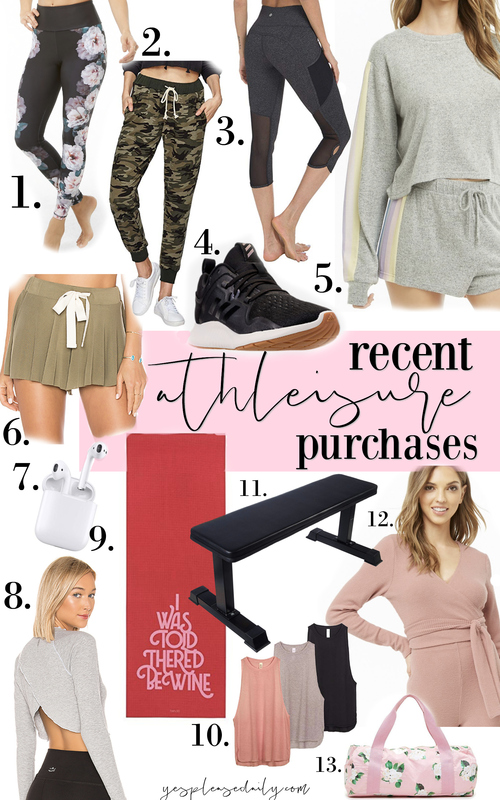 I hope you enjoy some of these athleisure purchases as much as I do, happy shopping! 1. Floral Leggings (Two Colors, $22) // I’m obsessed with these leggings. The quality is great for the price and I love dressing them up with a sweater for running errands or meetings. 2. Camo Joggers (Multiple Prints, $19) // I ordered a medium in these because I felt they may run small and they’re actually too big, so I’m going to swap them for a small. They’re so comfy though and super cute! Such a steal for under $20. 3. Mesh Cut-Out Leggings (6 Colors, $19) // I’ve worn these working out and running errands, great for both ha! The detailing makes them look much more expensive. 4. Adidas Running Shoes (5 Colors, $45!) // I cannot believe the price on these, I have a feeling they will go FAST! I received mine in the mail yesterday and I’m super happy with the quality and comfort. I ended up going with black because I love the small tan accents & I’m a sucker for black + tan together but it was SO hard, there are so many cute colors. Definitely snag these while you can. 5. Stripe Trimmed Shorts & Stripe Sleeve Top ($13, $15) // This set is the set of my dreams. It’s soft as butter and so cute! It reminds me of Wildfox sets but such a better price point. It may be a little cold to wear out and about now, but I can’t wait to wear this all spring long. 6. Free People Army Green Shorts ($35) // Ok, ok I know it’s January but I couldn’t pass up these shorts on sale! These will be so cute this spring with an oversized sweater and sneakers + I’ll be lounging around the house in them until the warm weather is back. These won’t last long so snag them while you can. 7. Apple AirPods ($159) // To be fair, these aren’t a January purchase BUT if you don’t own these, they should be a January purchase for you! They are SO nice for working out and life in general. I’m obsessed. 8. Free People Tulip Back Tee (More Colors & Sizes Here, $48) // A little pricey, but I’m a sucker for cute athletic wear because it’s what I wear most often. 9. “I Was Told There Would Be Wine” Yoga Mat (More Phrases, $32) // If you are doing BBG this mat is so great to have! It helps if you need to do it wherever you are. 10. Set of Three Workout Tanks (Multiple Color Combos, $24 for 3) // I already owned one set of these and I wear them so much. They are great for working out or as a base in a cute outfit. I recently ordered a second set. 11. Workout Bench ($49) // This is so great and sturdy + a good price. It’s very helpful when working out, I can’t wait to show you guys my little gym area soon! 12. Cozy Wrap Top (Two Colors, $15) // How cute is this?! It’s SOOOO soft too. It’s perfect for throwing on after a workout or pairing with flares for a fun and flirty outfit. 13. Floral Gym Bag ($41) // I have lots of purses but no throw & go duffle bags. I love this print and the brand is very reputable, knowing it will last for years.